sons of anarchy break down barriers, not jaws? | moonwort. ← why so quiet on $612 billion bill that nearly equals bail-out proposal? sons of anarchy break down barriers, not jaws? The new series on FX, Sons of Anarchy, is a fitting project to take up the reigns when Vic Mackey and “The Shield” get two to the back of the head after this season. I’m not sure if some of the revered talent formerly at other masterpiece-script shows wandered over after the writing strike, but each episode plays out like a mini-movie (something I applaud FX for) with another disaster diverted in the name of the “the club.” I think a simple theme of what I’ve seen so far is that: problems beget problems, lies require more lies, chaos brings chaos. In just a few episodes, the show already has already put on an immense display of characterization, as the backdrops to the stories of the main figures began to unravel each moments plays more and more notes of the soundtrack to their lives. I think if people took a devoted look at the lead character, Jax (played by Charlie Hunnan) they’d see bits and pieces of themselves, scattered all through out – similar to most great, conflicted lead characters. He comes off as humble, smart, charming (coincidentally, also the name of the town the drama is set in) – and just so happens to co-lead a historic bike gang he embraced due to nepotism (Source: See dead father, mother, and current club president/stepfather) that pre-determined his fate. Do bad things, but be conflicted about the price you’re willing to pay to achieve goals – and then return to charming, but misguided youth the next day. Some might call that a psychopath. I just call it depth. And reality. The other characters (Peggy from ‘Married with Childen, Hellboy, and the white guy who gets paralyzed in Remember The Titans) make up what seems to be an FX theme….large, stellar casts of semi-forgotten/semi-successful actors or maybe just those due for a comeback. But, the tug o’ war between the open-road warrior and the open-minded explorer is the real eye of the storm. Struggling for identity, struggling for the grasp of his father’s true aspirations and inner ideals, struggling to fill shoes, struggling to keep blood off his hands – and off his heart (and away from the hands of karma). I think we can all relate to that struggle between good and bad – and can all relate to the ability to justify any bad when you’ve yet to truly open your mind, and accept change. Thankfully in 2008, the minds of Americans are beginning to waken up somewhat – and it’s not that unconventional to suggest that the majority of what we think when growing up is pre-programmed from outside sources. What is dictated by the school, what is dictated by the television, what is dictated by our parents with their own beliefs based on their pre-conditioning, images in music, commercials, the consumer market – you name it. Growing up, as a kid, what were you taught about anarchy? They hated the government, they draw bloody red, overextended A’s, and they could quite possibly be murderers, violent lunatics, and drugged-up outkasts from society turned revolutionists? Isn’t that along the same scope as Hitler teaching young Germans that the Nazi way of life was the only way of life? When I first saw advertisements for the show, I thought – oh my, will there be any backlash? 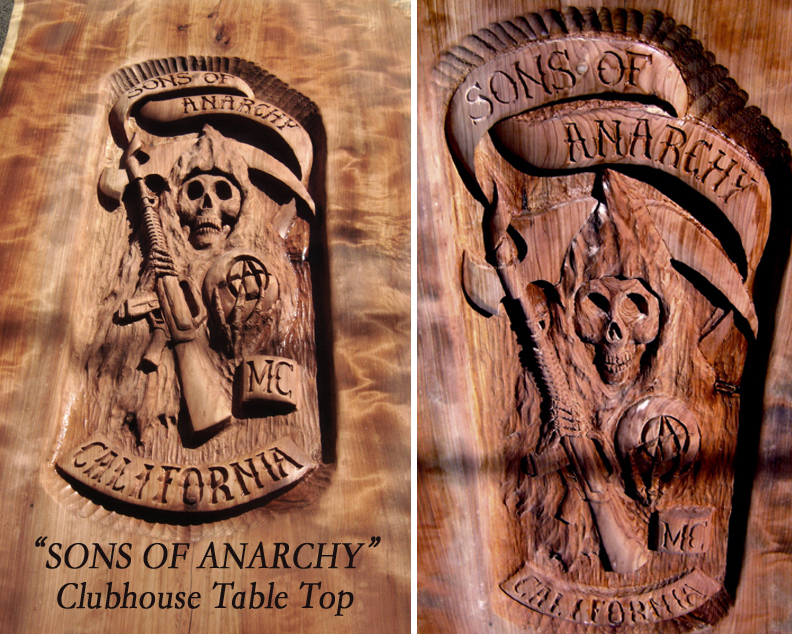 After watching the first several episodes, other than the words SONS OF ANARCHY embossed on their black leather jackets, as well as tattooed on their entire backs – I was wondering when the show would began touching on anarchy. This sort of makes me think of those Windows commercials where they passed off Windows Vista as a product called “Mojave” to test subject to combat their perceived “bad representation” of their product before people had even experienced it. What if someone expressed these ideas as a central theme in their new approach to life that they called, soularchy*? What if the societal indoctrination was removed and someone looked at the ideology and not the negative connotation of the umbrella term under which the ideas and people are cast? What if the Black Panthers were called the Rights Restoration Committee? Would more people have supported their cause just because they were branded differently? It’s all semantics. None of the above commentary was meant to expound my beliefs on the ideas of anarchy and the Black Panther party, although I respect their rights to have their chosen set of beliefs. I just hope that everyone realizes they consciously love/hate, judge/overlook, & accept/reject ideas based on their own opinions, formed under their own due diligence with an open and honest mind. I do know, however, that if I wanted to affect an entire country’s future generation of youth, I would start with their textbooks.